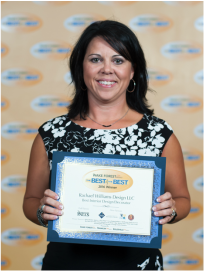 I began working in the construction industry over 15 years ago when my husband formed his custom building firm, Williams Custom Building. I assisted with developing the floor plans, design schemes, and overall look of the homes he built. When working with his clients, I realized there was a need for a designer to assist and coordinate finish selections for them. They were often left to make appointments in showrooms with no idea of what was in their budget, what was going to be the most efficient and functional for their family, and how to coordinate it all. I also watched my husband struggle with miscommunication between his clients and the showrooms when it came to final selections that were made by the client, and installs that weren’t what they were expecting. I knew there had to be a better way, so I decided to go back to school and get formal training and education in design and develop my own Interior Design business. My passion is in construction, so that is where I decided to focus my design work. I have first-hand experience in construction schedules, working with showrooms, working with clients who have a hard time visualizing, and effectively communicating what can be expected for the finished product. I am also a mom of two energetic, athletic kids with very busy schedules, so I understand the need for your home to function effectively but also be beautiful. I also understand the need for home builders to showcase their homes among the others on the market, but maintain budgets at the same time. Whether you are in the market to build your dream home, or are a home builder wanting to give your homes that special touch, I would love to collaborate with you to design a beautiful, functional, masterpiece home you will be proud of.